Indigo Creek Golf Club is a lowcountry Myrtle Beach golf course that is located on the south end of the Grand Strand in Murrells Inlet. Named after the land that the golf course is located on, Indigo Plantation, this course is home to water and wildlife that designer Willard Byrd uses the natural beauty of to enhance your round of golf. Your 18 holes are surrounded by large oak trees, winding creeks and of course Bermuda as the greens are Tift Dwarf and the tees, rough and fairways are all Bermuda grass as well. 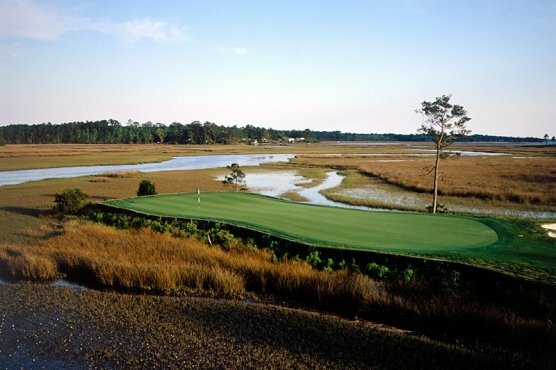 When you add Indigo Creek Golf Club to your list of courses to play for your Myrtle Beach golf package, you get an almost 6800 yard golf course that has been ranked as “Top 10 Places to Play” and given 3 stars by Golf Digest magazine. Indigo Creek offers a great balance of budget and easy of play, surrounded by a laid back atmosphere for an affordable and memorable round of golf. Back in 2013, Indigo Creek put $500,000 into the property to bring the level of play up, and improve the playability of the course. The most memorable holes at Indigo Creek Golf Club are span of 3 on the back nine: 11, 12 and 14. Many will say that these three holes are the best holes on the golf course. Number 11 is a par 3 that requires a carry over water to the green with a bunker on the left. 12 and 14 are both par 4’s that has a dogleg left and water to deal with on each, respectively. The two par 5’s (9th and 18th holes) are no slouches either …… #9 is a monsterous 535 yard Par 5 that is the hardest hole of all. It’s a dogleg left and feeds into a pond in the middle of the fairway – perfect for a collection of tee shots. And your finishing hole will run about 530 yards and is shaped like a crescent moon. Indigo Creek Golf Club also has a great instruction facility located on site. Be sure to check out the Glen Davis Golf School, which has on-site instruction for golfers of all skill levels. If you are looking to relax after your round of golf, visit the bar and grill with a back patio, perfect for enjoying the outdoors and happy hour with your buddies.